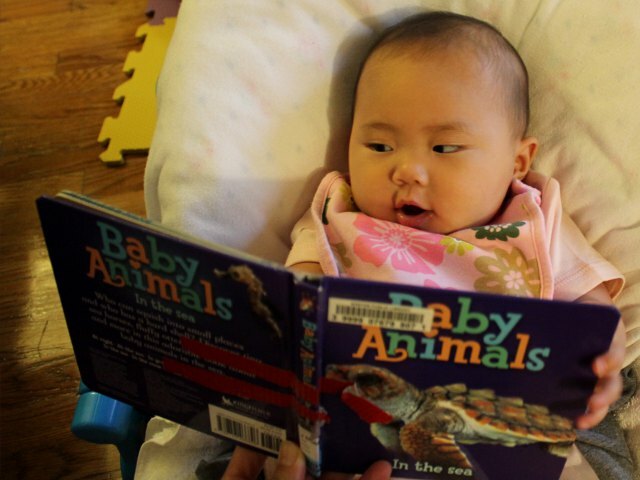 Arya likes looking at animals so the cute turtle on the front cover of Baby Animals in the Sea by Kingfisher attracted her attention. With a purple background and multi-colored title font the cover is well designed to appeal to young babies. The rest of the book relies on the same combination of colorful backgrounds and cute pictures of real animals. Baby Animals in the Sea shows seven different sea creatures: turtle, dolphin, octopus, otter, walrus, sea lion, and sea horse. Each pair of pages has text and a tiny picture on the left and a large photo of the animal on the right. Different color backgrounds create contrast between pages while font changes add appeal to otherwise straightforward text. The pictures of different sea animals are terrific. Each shows the animal in realistic style with intricate detail visible on each page. Arya really liked the dolphin, but I thought the snugly sea lion staring at the camera was the best. Text consists of the name of the animal on the top of the left-hand pages and a short paragraph describing the animal. A tiny picture of the animal (which is different than the main picture on the right-hand side of the page) and a one or two word action phrase are placed on the bottom. Kingfisher uses a variety of font elements including size changes, bolding, and changes in orientation to create visual appeal with what would otherwise be a static block of text. While likely better than plain text, the font elements do make it more difficult for little readers to get through the book by themselves. Baby Animals in the Sea is great for all children who like animals and perfect for youngsters before a trip to the aquarium. Pictures and colorful backgrounds are enough to maintain the attention of young babies while the short paragraphs provide enough information about each animal to interest school-age readers. Baby Animals in the Sea costs (including shipping) under $6 new and under $4 used from Amazon.